MPVs, with their ability to carry entire families and fit in a whole household worth of luggage, are a popular draw in India. 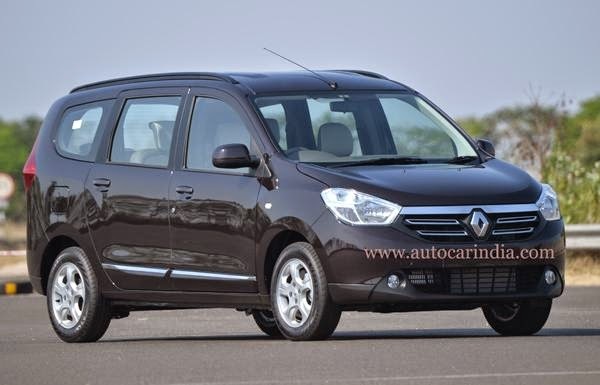 And the segment has a new entrant – the Renault Lodgy. This big new MPV is based on Renault's last big ticket product – the Duster. But can it repeat the Duster's success? While it does look good enough on paper, we simply had to get behind the wheel to find out. The biggest thing that stands out when you first see the new Renault Lodgy is its size. It’s massive — 4.5 metres long, 1.7 metres tall and with a 2.8-metre wheelbase — just the kind of dimensions you want for good interior space. And it’s also unashamedly boxy in its pursuit of maximum inner volume, but you can see that a decent effort has been made to disguise this bulk. Though the roofline is virtually horizontal, the subtly rising window line somewhat disguises it and at the front, the bonnet protrudes far enough to make it a two-box shape. Subtle contours come out from the front and rear wheel arches to give some form to the otherwise slabby sides, and the band of chrome along the doors is placed low enough to add some character. The nose too is rather elegant, with its tastefully detailed chrome grille, big ‘lozenge’ logo and soft-looking headlamps. Still, there’s only so much you can do to disguise such great mass, and it’s emphasised by the dwarfed 15-inch wheels, as well as at the rear, where the shapely tail-lamps aren’t quite enough to detract from the flat and vertical tailgate. Getting in is easy enough,the car is at just the right height for you to walk inside. 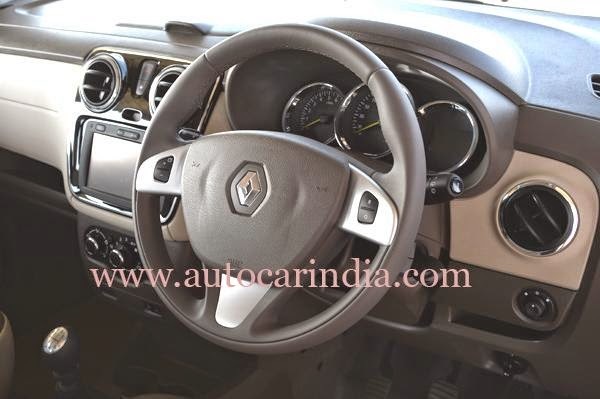 Once seated, you'll notice the dashboard which is unique to the Lodgy but still feels very familiar to the Duster's. 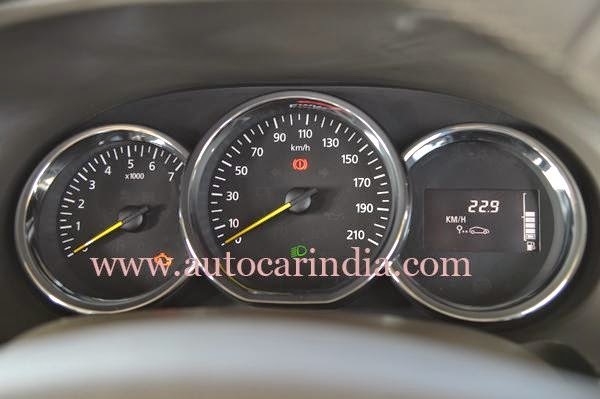 And that's not all, parts like the air-con controls and vents, gear lever, dials, stalks, steering wheel, window switches, and most of the buttons are lifted from the recent AWD version of the SUV. 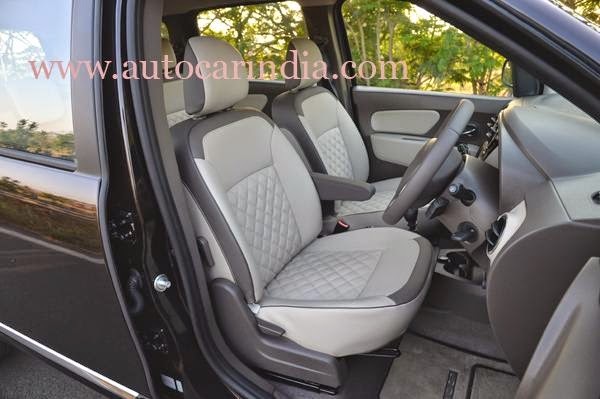 Even the front seats seem to be identical, though these are tastefully upholstered in quilted and perforated leather, which look quite plush. The other elements that help up the premium feel in the Lodgy's cabin are the dashboard’s brown and beige two-tone colour scheme and the glossy piano black centre console with silver accents. It’s a pretty practical cabin too, with each row getting two bottle holders and a 12V charging socket of its own. 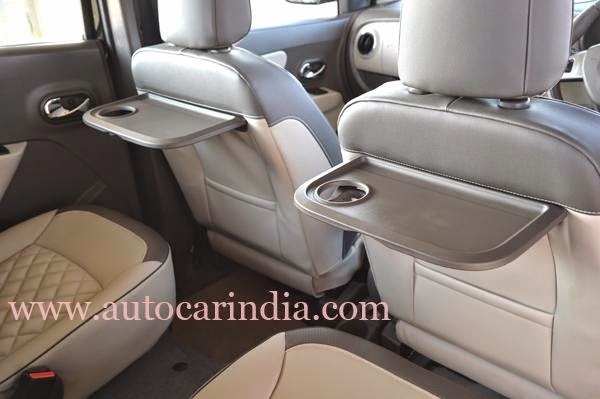 The second row also has small tray tables that fold up from the back of the front seats and each comes equipped with a cupholder. At the front, the glovebox is a bit small, but there’s an uncovered recess just above it, as well as a shallow covered bin on the top of the dashboard that’s good for small knick-knacks. However, up front, the cupholders are small and shallow. This top-spec RxZ, has, by segment standards, a good amount of equipment. 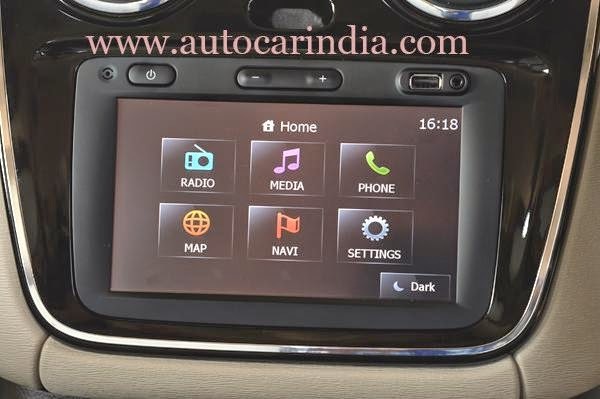 Starting with the touchscreen unit that’s been plucked from the Duster — it houses USB and aux inputs (no CD player), as well as satellite navigation. It also comes with a rear-view camera and rear parking sensor, handy on a vehicle as massive as this. 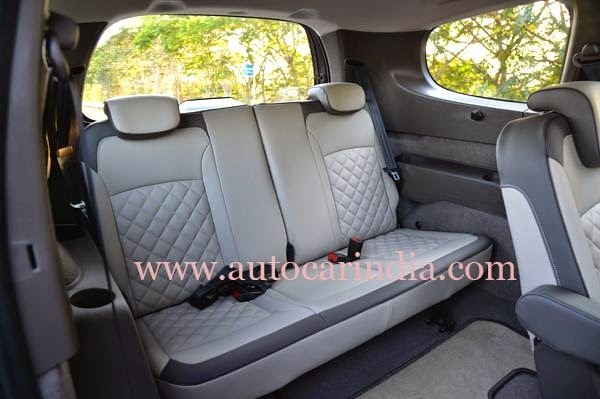 Of note, the roof-mounted air-con system has been specially developed for the Indian Lodgy and it gets dedicated air-con vents for the rear two rows. On to the all-important matter of space. You can have the second row as either a bench or two individual captain seats, and though these chairs are comfy, they’re not as supportive as the ones in the front; what there's plenty of, is room. Access to the last row comes by flipping down and tumbling forward the second row, but these can’t be slid back and forth.The good news is that there's loads of headroom and sufficient knee room in the last row. It’s wide enough for two adults to sit comfortably, but the high floor results in a knees-up seating position. You could also easily fit three kids in here, given that the headrests are placed towards the edges of the seat and that there’s an extra seat belt in the middle. For your storage needs, there are a number of ways to configure the seats. With all seats in place, there's only about 210 litres, but it’s more or less on par for the segment. The third row backrests split and fold down for a little more room, or for more still, you can flip the whole row forward. And if luggage is a bigger priority than passengers, the third row can be detached and removed altogether. 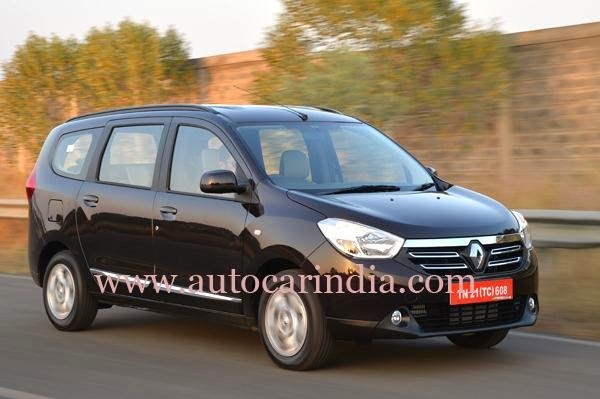 The Lodgy will be the 12th model in India to be powered by the Renault K9K 1.5 diesel;there's no petrol on offer for now. The good news is that, like the Duster, the Lodgy will get both the standard 84bhp diesel and the more powerful 108.5bhp version (with a six-speed gearbox). It feels quick too, and though we didn’t get a chance to stretch its legs on the highway, the Lodgy moved forward with more than sufficient gusto. This latest version of the K9K gets the latest ‘T4’ architecture, which is essentially an electronics upgrade to meet the latest European regulatory requirements. The upshot is a smoother power delivery evident in the Lodgy. Like in the Duster, you still get a dose of turbo lag that you have to learn to drive around, and a slightly heavy clutch. However, despite these, there’s little doubt that the Renault powertrain is the best in its class. 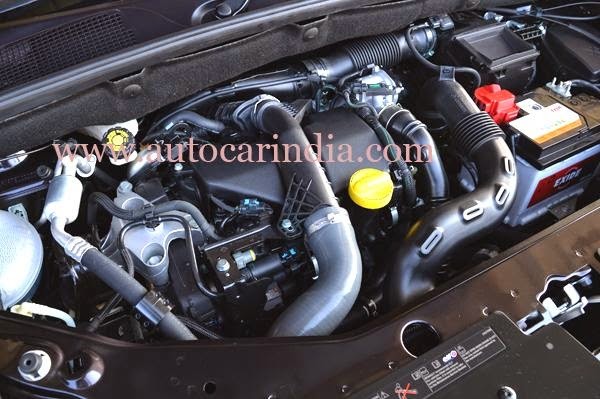 The engine is really smooth, it revs freely, and though the power delivery may not be as linear as Honda’s i-DTEC motor, it has a lot more punch which makes it effortless to drive. And, the tall sixth gear makes highway cruising a breeze. 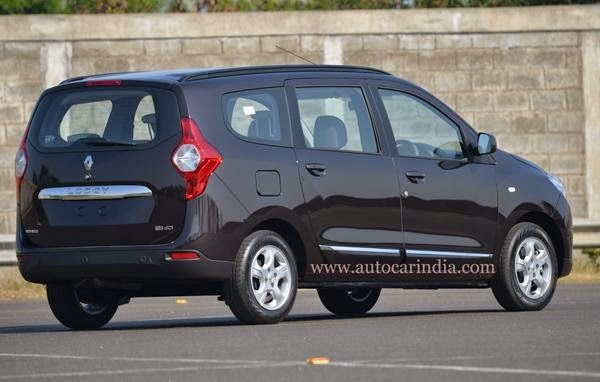 The Lodgy, like the Duster, has a superbly pliant ride. It doesn’t have the independent rear suspension of the AWD Duster, but its longer wheelbase gives it superb stability. The Lodgy feels very planted in a straight line, and though it’s no benchmark in agility, it steers with remarkable confidence for a car of this size riding on seemingly small wheels. It was amply clear, even after our short test drive around the Renault test track, that this is one of the best driving MPVs in India. Even when we drove it way back in November 2012, we knew the Renault Lodgy had a lot of promise. It’s offers plenty of space, is practical and easy to use, and the 1.5-litre diesel motor has more than acquitted itself in this car. In terms of positioning, the Lodgy — by virtue of its size, cabin space and power — is in Innova territory. The key factor, as ever, is price, and if Renault manages to find a sweet spot in the sub-Rs 15-lakh range, this could well be the carmaker's next big ticket product.